Part I. Basic Concepts. Physical quantities, units, the SI system. Basic concepts of measurements and measuring systems. Measurement as a source of information. Structure and the main characteristics of measuring systems. Basic informative concepts of measurement and measurement evaluation. Measurand, measurement information. Types and tasks of measuring techniques. Time functions and signals corresponding to the measurand. Distortion of measurement information, measurement errors. II. Aids Used in Measurement Evaluation. Probability calculus, stochastic (random) processes (Introduction). Probability calculus. Stochastic (random) processes. Computing techniques. Approximate values and their errors; operations with approximate values. Logarithmic units, levels. Aids used in the numerical evaluation of measurement. III. Measurement Evaluation; Means and Methods. Evaluation of deterministic measurement information. Part 1. Evaluation of zero and one-dimensional measurement information. General problems. Evaluation of one-dimensional measurement information. Evaluation of deterministic measurement information. Part 2. Evaluation of two- and multidimensional measurement information (signals) by value; mathematical and geometric interpretation of functional relationships determined by measurement. Empirical formulae. Graphical methods. Evaluation of deterministic measurement information. Part 3. Evaluation by frequency; frequency analysis, spectral evaluation; methods of analysis. Basic concepts. Examination and evaluation of the frequency dependent behaviour of measuring instruments. Devices used in frequency analysis. The objectives of frequency analysis. Evaluation of stochastic measurement information. Basic concepts, general problems. Statistical analysis. Correlation analysis. References. Appendix. Subject Index. The information obtained about a measured object is called crude'' measurement information and must be related to the conditions under which the measurement took place. Usingcrude'' measurement information as a starting point, evaluation produces physically correctly interpreted data with their estimated (or corrected) error. Although a number of works deal with the evaluation of measurements, they either appeared a long time ago or serve essentially different aims. This book gives a comprehensive and current overview on the basic principles, aids, devices, and methods in the evaluation of measurements performed in all fields of technology and science in order to gain information about physical or technical objects. It also provides an introduction to the more recent problem areas such as frequency analysis, stochastic measurement information, real time treatment of measurement information, etc. 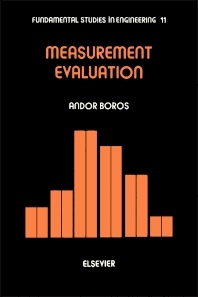 The book will prove useful in solving the problem areas encountered by those involved in measurement technology and measurement evaluation. It will also serve as an introduction to those not possessing any specialized and advanced technical training in the subject matter.